When your sweet tooth craves for a treat but your brain warns of calorie overload, try these delectable Low-Cal Sweets and Desserts. 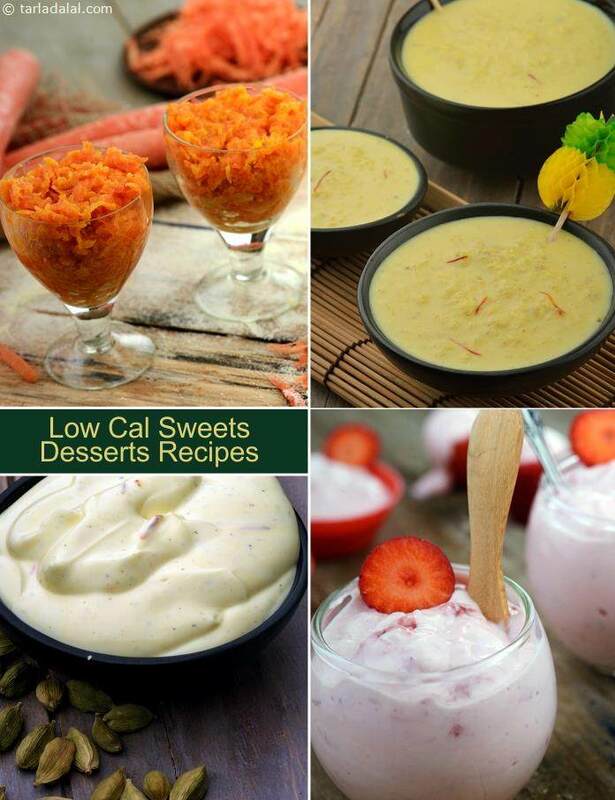 When you taste delightful recipes like the Ragi Sheera , Strawberry Yoghurt and Green Grapes Sorbet , you will be amazed by the awesome effect achieved at low cal counts! Apple Crumble... that’s a delicacy our hearts would crumble at the sight of. The fruity aroma of stewed apples together with the intense aroma of cinnamon makes one feel giddy with delight. Afruity delight that is low in calories yet very tasty. Fresh pineapple puree perks up the flavour,however you need to cook it with sugar to get the real flavour. This sumptuous, easy-to-make, sweet dish can be made in advance and refrigerated. Figs have been used as they are low in calories as compared to other dried fruits and are also rich in fibre. To control the calorie count further, I have used low-fat milk and restricted the sugar to minimal.